Lovely Prime Ocean Front at the popular Maalaea Kai Complex! Everything one would want is presented in this 1 br/ba with a beautiful and tranquil "Prime Oceanfront View". Swim, snorkel and stroll along the nearby sugary golden beach (longest beach on Maui!) Revel over the sights of the Maalaea Bay, the majestic volcano "Haleakala" and the sparkling and romantic Kihei lights across the bay at night. Breath in the fresh ocean air and feel the tropical cooling breeze while sipping Mai Tai's on your lanai. The entire place is tastefully decorated with the spirit of Aloha in mind. Bedroom suite provides a comfy queen size bed and for those who require tv/cable to lull them to sleep there is one to enjoy in the bedroom just for you! Nicely remodeled bath with tiled walk-in shower, free secured wifi, internet, cable, telephone. Remodeled kitchen has stainless steel appliances, granite counter top and very well stocked for the cook in mind. The elevator is conveniently located nearby and condo has own assigned parking space too. Shared laundry facility is super clean and spacious and there is one located on each floor with 3 large capacity washers and dryers each (fee payment for laundry is by credit card or pre paid card only). Other coveted amenities to enjoy are of course the large pool, very nice and inviting bbq and dining area, pool side lounges. Condo also provides for your fun... beach chairs, beach umbrella, beach towels, binoculars for whale watching and a cooler for your excursions. What more could you ask for...book today! Awesome Property! Great Condo! Beautiful views and very nice property. Well appointed with a nice kitchen, AC and nice furniture. Watch the turtles swim around and the waves crash from the lanai! Perfect. This was one of the best rental apartments weve used in all of our travels. It was well equipped in the kitchen and provided all the amenities you neeed for a beach day. The local beach (Haycraft) is within walking distance and has parking if you want to drive. Just walk beyond the small crowd by the parking lot and enjoy the entire beach to yourselves. The bed was cozy and the AC in the bedroom worked well. It would have been nice to have AC throughout, but you adjust and there is a nice breeze. The laundry is at the end of the building and costs $3 per load (wash and dry). The machines take debit cards so dont worry about having quarters. We would recommend the apartment and definitely stay again. Great Maui Vacation We were visiting Maui since my brother-in-law decided to do a destination wedding. We decided to make a long vacation out of the stay and were on the island for 12 days. We absolutely LOVED our condo. It felt a little like the luxury of a hotel room with the convenience of a home. This was our 3rd experience with a VRBO and by far the best! We arrived to flowers placed through-out the condo and small packages macadamia nuts. Little things that provided a warm welcome. The condo has beach chairs, an umbrella, boogie board, beach towels and a cooler - all things we used quite a bit during our time there! We were a little worried about some reviews that mentioned that Maalaea was windy. The breeze was wonderful! It kept that area of the island cooler and since the condo unit blocks the majority of the breeze by the pool/lawn area it just felt comfortable. In fact a few days we left beaches near Kihie thinking it was so warm and muggy and came back to a comfortable condo and pool. The sea turtles were frequent visitors to the rocky beach out front making it enjoyable to sit out on the lawn chairs in the afternoon and watch them swim. It appears most of the condo units are owned by retired couples which meant it was usually quiet around the condos. The wedding was at a resort in Lahaina and after being around all the traffic and people near the resorts we were so glad we stayed in Maalaea. We we were able to see more of the island being centrally located on Maui. Not to mention it took us almost an hour to get to the wedding in Lahaina because the traffic was so bad at that time our max speed was around 20 mph. We were also able to walk to the Maalaea Harbor for our fishing & snorkeling trips as well as dinner at Beach Bums (great restaurant!). We had a couple minor issues come up while we were there but Andrea was quick to respond and resolve our issues even on a weekend. 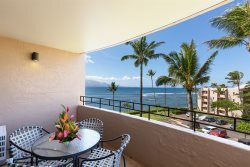 I'm not sure another Maui trip is in our future but I wouldn't hesitate to recommend this condo to anyone looking for a place to stay in Maui! 40th Anniversary Trip We absolutely LOVED the condo and the perfect oceanfront views. The place is beautifully decorated, we had everything we needed in the kitchen and the bed was very comfortable. We stayed the week after Thanksgiving and were quite pleased there was an air conditioner in the bedroom which we needed. Everyone we met was so friendly and enjoyed the Christmas lights that were put up on the hedge while we were there. I would definitely recommend this unit to anyone considering a trip to Maui. Great Condo! I have stayed in many condos on Hawaii. This condo was set up with everything you needed for a great stay. Loved the beach chairs!